Michael Mandiberg has published a new book. Books, in fact. He spent the last three years parsing the entirety of Wikipedia into a $500,000 set of encyclopedias. I can’t stop thinking about this. Just 15 or 20 years ago, an encyclopedia was a set of books housed on a single shelf in my school’s library. With a place for all the world to share and catalog knowledge, Wikipedia has grown like the mystery house in House of Leaves. 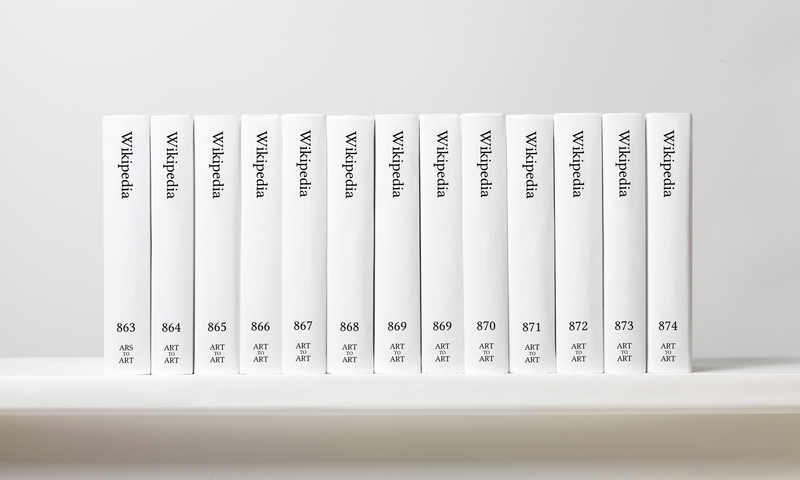 Print Wikipedia draws attention to the sheer size of the encyclopedia’s content and the impossibility of rendering Wikipedia as a material object in fixed form: Once a volume is printed it is already out of date. It is also a work of found poetry built on what is likely the largest appropriation ever made. One of my favorite things to listen to when working in Excel is the Wikipedia soundscape. Live entries and edits on Wikipedia become sounds – bells and gongs, with length of note and tone based on the extent of the change. Each sound is shown as a growing circle with the topic listed in the center. It is mesmerizing and goes on forever. Just now I saw edits for Angry Birds 2 and the Kuiper Belt. Are those Wikipedia editors working at a computer on a nearby street or are they insomniacs across the globe? I think back to an image my dad described to me to illustrate how incredible the printed word is. In the dark ages, monks toiled over pages, scribing and illuminating copies of the Bible and guides on herbs and medicines. It’s easy to look at the pace of change in our lives and think the whole world is changing. But when I look closely, I realize a lot stays the same. I love reading about futurists who describe a different world of work within our lifetimes, but I’m skeptical. If anything, we’ll work at similar end goals but much, much faster thanks to new tools and innovative new industries. We’re the monks toiling over the manuscripts, making small changes based on the knowledge we have. What happens when the whole world gets together to create things? Wikipedia.